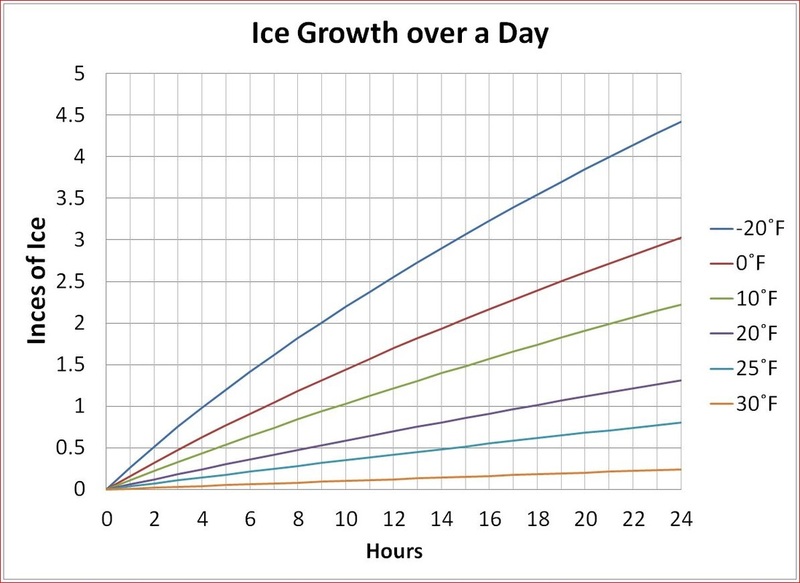 Ice thickness for BLACK ice. At least 2X as much ice is needed for grey ice. We are in the process of updating them to be snow kite specific. Remember, there is no such thing as 100% safe ice and many factors affect the strength of ice besides thickness. This information is offered as reference and is in no way a substitute for good judgment. Know before you go. Always be aware that ice seldom freezes uniformly. It can be 12" where you are and less than 2" a few yards away. Weather and temperature changes causing thawing and refreezing. In reservoirs pockets of air can form under the ice on lakes where the water levels are raised and lowered by flood control. The insulating effect of snow slows down the freezing process and keeps thin ice thin. Long term coverage can weaken the ice as the warmer water below, especially in run off, will melt the ice from below even if the air is is well below freezing. Rotting vegetation can make ice thin. Ice formed over flowing water and currents is often dangerous. These thicknesses are based on CLEAR "BLACK" ICE. Ice with bubbles or grey ice conditions need at least twice the thickness we've listed here. These thicknesses reflect a broad margin of error and are higher than the thicknesses recommended by the U.S. Army Corp of Engineers. 5” is the minimum for snowmobiles and ATVs. 8”-12” is the minimum for cars or small trucks. Generally accepted minimum of five inches of ice is recommended for safe enjoyment of ice skating, ice fishing, ice boating, snowkiting and snowmobiling on lakes. However, even if the ice is several inches thick, variations in ice thickness is common and ice-covered water is never completely safe. Know the ice conditions before you venture out. Don't access ice with deep snow if you don't have solid information about the ice conditions before the snowfall. Let someone know when you will be on the ice and when you will return. Wear a PFD when you don't know if the ice is sound. Carry two screwdrivers, ice picks, or large nails to help pull yourself out of the water. Avoid areas of open water especially inflows and outflows. It is important to pay close attention when kiting or walking on ice. Cold water will cool a body 25 times faster than cold air of the same temperature. Do not move suddenly. Lie on your stomach and spread your arms and legs (like an airplane). Stretch your arms over your head and bring them together. Roll away from the crack. Do not bend your knees or elbows. Do not remove your winter clothing. Heavy clothes will not drag you down. They will trap air to provide temporary warmth and flotation. Turn toward the direction you came since the ice was strong enough to support you on the way out, it will probably support you again on the way back. Place your hands and arms on the unbroken surface. Kick your feet and dig in your ice picks and swim your way back onto the solid ice. This can be done even without ice picks but ice pick make it a lot easier. Slide onto the ice like a seal. Lie flat on the ice and roll away from the hole. This will help distribute your weight. Get to a warm, dry, sheltered area out of the wind. Watch the videos at the bottom of this page. The video on the left is the best informational video on how to deal with going through the ice that we've ever seen. If you take the time to "know before you go" the chance of going through the ice is unlikely. But if you do this is invaluable information. In the event that you or someone else does enter the water you need to be aware of the following symtoms. This response begins immediately upon immersion and will peak within the first 30 seconds to 5 minutes. Breathing and circulation are affected. Involuntary gasping, rapid breathing, dizziness and confusion start immediately causing water inhalation and possible drowning. A sudden rise in heart rate and blood pressure also occur, possibly resulting in stroke or heart attack. A person must attempt to self-rescue, stay afloat or swim to safety within the next 30 minutes. Nerves and muscles in the arms and legs will cool quickly. Strength of handgrip and movement speed will drop 60 percent to 80 percent. Survivors being removed from the water face significant physiological changes in blood volume and distribution. Rescue method and proper treatment of the victim is crucial. Handle victims gently and minimize movement. Wrap the person in blankets to prevent further heat loss and transport him or her to the nearest medical facility in a warm vehicle. These videos show examples of how one can save themselves. ​Simply a reference, there is no guarantee that this will save you. Planning ahead and knowing the conditions are your responsibility and your best protection. Click the button above to open Bob Dill's Lake Ice page. It is an excellent site for all things ice knowledge related.